The Allen Independent School District serves the rapidly growing city of Allen, Texas, a suburban community located 23 miles north of Dallas. Student enrollment has more than doubled since 1989, bringing the current number of students to approximately 19,000 in grades K-12. Students attend one of 16 elementary schools, three middle schools, one freshman center and one high school. Allen ISD enrollment has grown steadily since the early 1990s. The district is currently growing at a rate of approximately 4 percent. Regardless of enrollment increases, Allen ISD is committed to maintaining acceptable student-to-staff ratios and class sizes through the hiring of additional staff or the distribution of students to "sister" campuses if necessary. 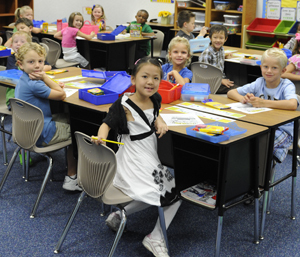 Elementary students enrolling in Allen ISD for the first time may be assigned to a school outside of their attendance area if no space exists in their grade level. Allen ISD has earned an Recognized Rating under the 2011 Texas Education Agency accountability rating system. Twelve individual Allen ISD campuses were rated Exemplary and 10 campuses were rated as Recognized. See the ratings here. The ratings are based upon results from the Spring 2011 TAKS (Texas Assessment of Knowledge and Skills) and the completion rate of high school students. Schools and school district ratings are determined by performance from all students in all subjects and also by students in all sub-categories in all subjects. Texas school districts and campuses receive exemplary, recognized, acceptable or unacceptable ratings based on overall scores and scores from three separate categories including African American, Hispanic and Economically Disadvantaged. The high school completion rate is also calculated into the ratings. There are 26 different measurements for a school district or campus rating.